Note: Where there appears to be a conflict between the guidance in Part M and Part K, Part M takes precedence; see the Notes to the Requirements. 1.19 If site constraints necessitate an approach of 1:20 or steeper , an approach incorporating ramped access should be provided. Ramps are beneficial for wheelchair users and people pushing prams, pushchairs and bicycles. 1.20 Gradients should be as shallow as practicable, as steep gradients create difficulties for some wheelchair users who lack the strength to propel themselves up a slope or have difficulty in slowing down or stopping when descending. 1.21 Ramps are not also necessarily safe and convenient for ambulant disabled people. For example, some people who can walk but have restricted mobility find it more difficult to negotiate a ramp than a stair. 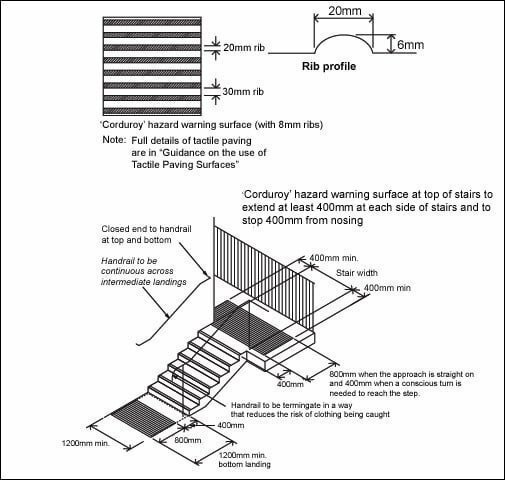 In addition, adverse weather foundations increase the risk of slipping on a ramp. It is therefore beneficial to have steps as well as a ramp. 1.22 Some people need to be able to stop frequently; for instance to regain strength or breath, or to ease pain. 1.23 Wheelchair users need adequate space to stop on landings, to open and pass through doors without having to reverse into circulation routes or to face the risk of rolling back down slopes. 1.24 Some people have a weakness on one side. This leads to a requirement for support at both sides of ramps. 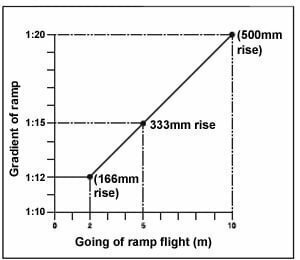 1.25 If the total rise of a ramped approach is too high, it can be unacceptably firing for wheelchair users and some people with walking difficulties, even if a number of rest landings are provided. Diagram 3 Relationship of ramp gradient to the going of a flight. clearly sign-posted steps are provided, in addition, when the rise of the ramp is greater than 300mm (equivalent to 2 x 150mm steps). 1.27 People with impaired sight risk tripping or losing their balance if there is no warning that steps provide a change in level. The risk is most hazardous at the head of a flight of steps when a person is descending. 1.28 The warning should be placed sufficiently in advance of the hazard to allow time to stop and not be so narrow that it might be missed in a single stride. 1.29 Materials for treads should be able to appreciate easily where to place their feet by highlighting nosings and avoiding open rises. 1.31 People who wear callipers or who have stiffness in hip or knee joints are particularly at risk of tripping or catching their feet beneath nosings. People with a weakness on one side or with a sight impairment need the dimensions of the tread to be sufficient for them to be able to place their feet square onto it. If the going is towards the upper end of the dimensional range, the flight may rise to a greater height without the need for an intermediate landing, as the tread is sufficiently deep to allow a person to stand and rest at any point within the flight. It should be noted that excessive rounding of nosings reduces the effective going. - slip resistance (Annex C). additional handrails divide the flight into channels not less than 1m wide and not more than 1.8m wide where the overall unobstructed width is more than 1.8m. 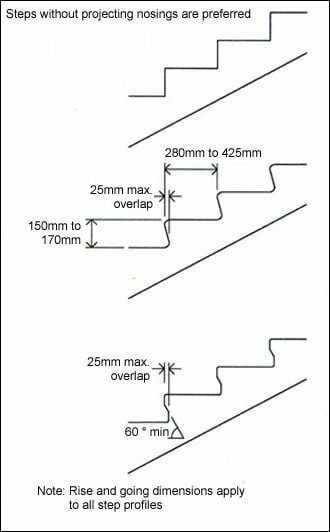 Note: In respect of 1.33(l) and (m), for school buildings, the preferred dimensions are a rise of 150mm, and a going of 280mm. 1.34 People who have physical difficulty in negotiating change of level need the help of a handrail that can be gripped easily, is comfortable to touch, and, preferably, provide good forearm support. 1.35 Handrails should be spaced away from the wall and rigidly supported in a way that avoids impeding finger grip. 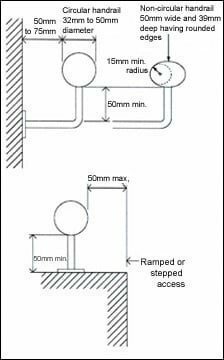 1.36 Handrails should be set at heights that are convenient for all users of the building and should extend safely beyond the top and bottom of a flight of steps, or a ramp, to give both stability and warning of the presence of a change in level. Consideration should be given to the provision of a second handrail on stairs in a wide range of building types, and particularly in schools, for use by children and people of short stature. 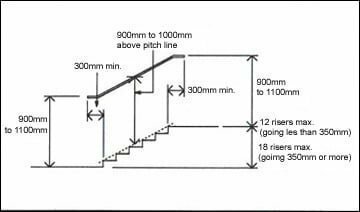 where there is full height structural guarding, the vertical height to the top of a second lower handrail from the pitch line of the surface of a ramp, or a flight of steps, is 600mm, where provided. it is continuous across the flights and landings of ramped or stepped access. its inner face is located no more than 50mm beyond the surface width of the ramped or stepped access. 1.38 Features of a building that occasionally obstruct an access route, particularly if they are partically transparent and therefore indistinct, or cause a danger overhead, should not present a hazard to building users. 1.39 Requirement M1 or M2 will be satisfied in relation to hazards on access routes where Approved Document K, sections 6 and 10 are complied with. Note: Diagram 8 has been moved to Approved Document K, Section 10, all other numbering remains the same.